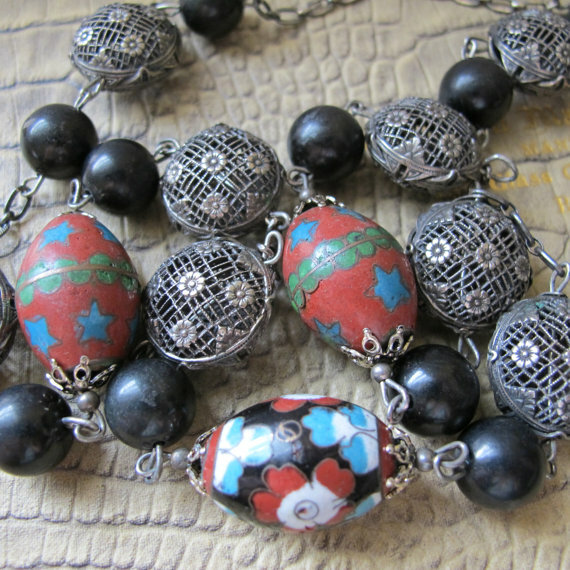 Etsy shop MaisonettedeMadness has on offer an unusual necklace featuring Chinese cloisonne beads. The necklace is described as 30 inches in length, with cloisonne beads measuring approximately 22x17mm, caged white metal beads 19x12.7mm. "Round almost black beads are stone or a Peking style glass, clasp is stamped sterling and the chain throughout is sterling silver, the metal wires are all silver in color, may vary in composition. The wire wrapped could be better." The stamped chain, beads, bead caps and clasp seem almost certainly to be of European or U.S. manufacture. The black beads seem to have been made to imitate black pearls, and may have some sort of coating? The Japanese, of course, made excellent hand-wound glass beads to imitate pearls. Could these be Japanese glass? Or are they in fact stone? 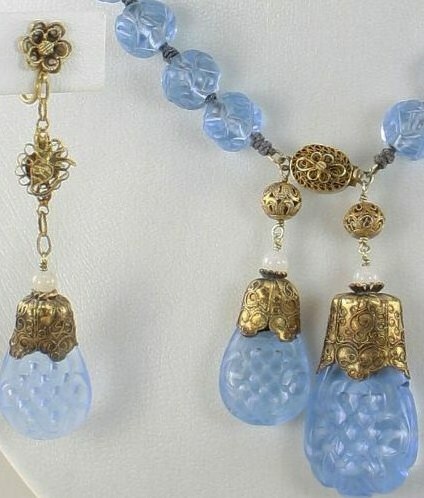 Findings are cast brass, with old-fashioned "petal" beadcaps. 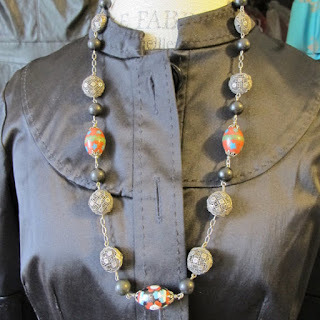 Where and when was this elegant necklace put together? Were all the components sourced at the same time, such as during the late 1940s or 1950s? Or was it assembled from disparate parts in a later decade? Puzzling evidence. 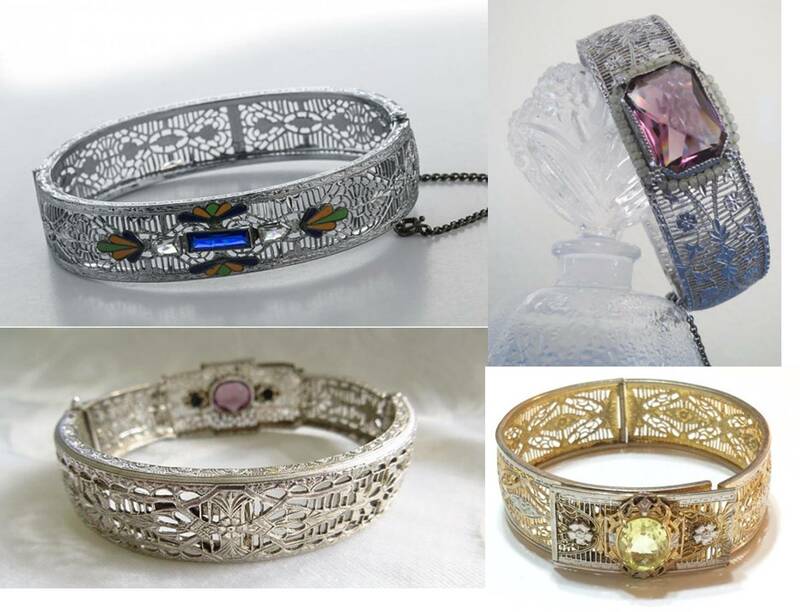 UPDATE: Does anyone besides me see a similarity in the cast filigree work in these Deco-era bracelets to the design of the metal beads in the necklace? 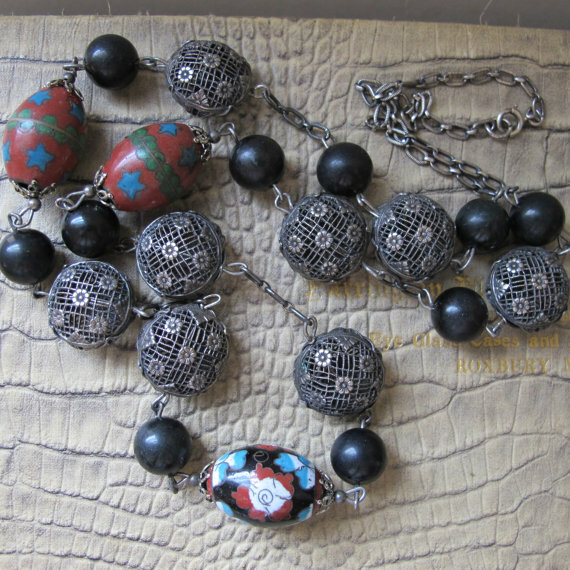 Note the Deco design motifs along the edges of the beads. Evidence that the necklace could date to the 1920s or 1930s?